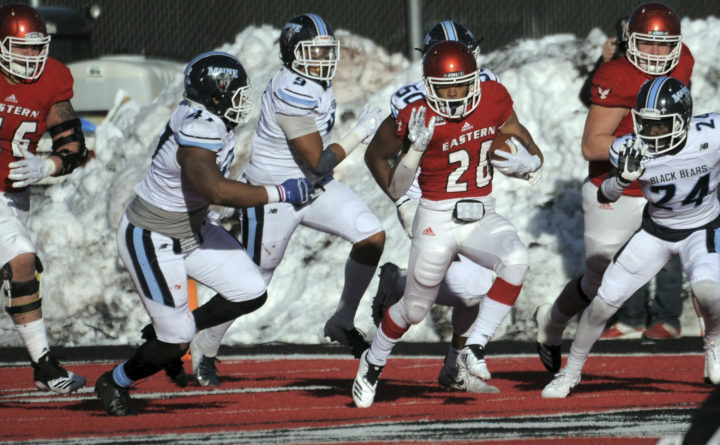 Eastern Washington Antoine Custer Jr. (28) runs the ball against Maine during the second half of an NCAA college football game Saturday, Dec. 15, 2018, at Roos Field in Cheney, Wash. The University of Maine football team’s historic season, which saw the Black Bears reach the NCAA Football Championship Subdivision national semifinals for the first time, has resulted in the team being ranked fourth in the country in the final STATS FCS Top 25 poll. The Black Bears (10-4) won the Colonial Athletic Association championship with a 7-1 conference record after being picked eighth in the preseason coaches poll. It is believed to be the highest UMaine has ever been ranked in a national football poll. The Black Bears also finished fifth in the final American Football Coaches Association poll of the season. The Black Bears went 7-1 against teams that were nationally ranked when they played them including wins over No. 8 Jacksonville State (55-27) and No. 3 Weber State (23-18) in the FCS playoffs. They lost to No. 4 Eastern Washington 50-19 in the semifinals. North Dakota State (15-0) beat Eastern Washington 38-24 on Saturday in the FCS title game to win its seventh title in eight years and earn the unanimous No. 1 ranking in the final poll. Eastern Washington (12-3) and South Dakota State (10-3) wound up second and third, respectively, followed by UMaine. The STATS poll is chosen by a national panel of sports information and media relation directors, broadcaster, writers and other dignitaries. New UMaine head coach Nick Charlton, who was the offensive coordinator under head coach Joe Harasymiak this season, said it is good to be recognized. He said there will be heightened expectations next season, but that it is to be expected and they will manage it. Harasymiak left to become the defensive backs coach at the University of Minnesota. It was the eighth time UMaine has appeared in the FCS playoffs and Charlton said it may be the first time UMaine has done so without a senior at quarterback. UMaine signal caller Chris Ferguson is a sophomore. Ferguson will be one of eight returning offensive starters next season, and the Black Bears will return eight starters on defense, in addition to the place-kicker and the punter. The CAA put a record-setting six teams among the 24 in the FCS playoffs. James Madison (9-4), the 2017 FCS champion, wound up ninth in the final poll with 7-5 Stony Brook at No. 16, 6-5 Elon at No. 19, 7-5 Towson in 20th and 7-5 Delaware in the No. 24 spot. UMaine beat Towson and Elon this season, and did not play James Madison, Stony Brook or Delaware. Weber State (10-3) was sixth in the poll and Jacksonville State wound up 10th.